Q. Would you like coleslaw, chips, fries or fruit with that? Q. Can you spare a quarter? Q. Have you accepted Jesus Christ as your personal lord and savior? Q. Do you know how fast you were going? Q. Where are you headed? Q. Did you pack your own bag? Q. What’s the purpose of your trip? Q. How long do you intend to stay? Q. What brings you in today? Q. What are the smallest letters you can read easily? Q. What was the first date of your last menstrual cycle? Q. How did you hear about the job? Q. What do you consider to be your weakness? Q. What do you write about? Q. Would you like to meet for coffee? Q. Who did you vote for in the last election? Q. Do you want to have children someday? Q. Can I bring you home to Mother? Q. Do you take this man to be your lawfully wedded husband? Q. Do you mind taking the trash out? Q. Does this dress make me look fat? Q. Did you pay the mortgage? Q. What do you mean you thought I paid the mortgage? Q. Did you fix the leak? Q. If not this weekend, when? Q. Are you working late again? Q. Why are you lifting weights? Q. Are you having an affair? Q. Do you love her? Q. Can you be out by the first? Q. Is that all there is? Q. On the rocks or neat? Q. How long have you been separated? Q. Would you like to go someplace more quiet? Q. Can I kiss you? Q. Is the stick shift in your way? Q. Do you like that? Q. Why don’t you take these off? Q. Could you come like this? Q. How do I taste? Q. Will you touch yourself for me? Q. Does that feel good? Q. Can you scoot down? Q. Am I too deep? Q. Do you want to flip over? Q. Can you take it all in? Q. Am I filling you? 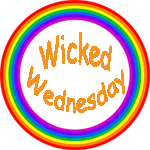 Read more fab Wicked Wednesday “Questions” entries here! Those are some excellent questions. We’ve been asked most of them, one time or another, haven’t we? Honor to have you visit here, CurvaceousDee! Thank you so much for stopping by and taking the time to comment. Ha! Favorite: What do you mean, you thought I paid the mortgage? Oh this is so clever, a life in questions! Brilliant! Brilliantly clever, I love it! I loved the way you told a story entirely through questions. Brilliant! That was really fun to write. Thanks!